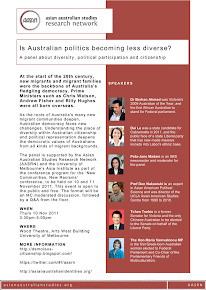 Diversity | Political Participation | Citizenship: Registrations open for Asian Australian Film Forum 12-13 Nov 2011! Registrations open for Asian Australian Film Forum 12-13 Nov 2011! The Asian Australian Film Forum 12-13 Nov is shaping up as a great follow up to the AAI4 'New Communities, New Racisms' conference. It is screening some great Asian Australian shorts and features, and a fantastic line-up of speakers that includes PJ Madam. Guests are encouraged to register to book a seat. Take a look at the website for more details.